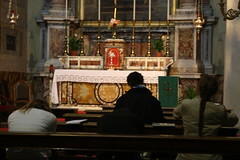 The retreat began at 10:00 a.m. with the exposition of the Blessed Sacrament. We invoked the Holy Spirit to come and open our hearts to receive what the Lord wanted to give each and every one of us that day. We prayed in a special way that the Holy Spirit would help us to respond with generosity to the graces received. We began with points of meditation using the talk that Pope Benedict XVI had planned to give at the vigil during WYD 2011 Madrid this past summer, but was unable to due to the storm. In it, he confronts the urgent questions the youth of today asked him during the vigil. He explained how a young person living in today’s society can be true to the faith while still aspiring to high ideals, since faith is more than the mere acceptance of certain abstract truths, but rather, an intimate relationship with Christ. 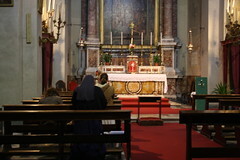 After the points of meditation, we had time for silent prayer before the Blessed Sacrament. Following the time of prayer, we had another meditation about how we should never grow tired of being good, especially when difficult moments arise. To help us, we should look to our model, our Blessed Mother. We should always remember that she is there for us as our mother and trust in her motherly love. We had a time of silent prayer in order to reflect on the meditations and to listen to Christ’s voice. Then we gave a copy of the Pope’s talk that was used in the first meditation to each girl so that she could read through it at a slower pace, underlining and reflecting on the Pope’s message, trying to go deeper and listen to what Christ wanted to say through the Pope’s words. After this time of reflection, we all had lunch together. It was a great time to get to know each other better and share the graces that each one had received. We give thanks to God for this wonderful day of retreat and for the opportunity of spending some time alone with Him. In the midst of a busy schedule of college studies, it was a great time to refocus our gaze upon what’s really important in life. As the retreat took place on the Feast of Christ the King, the last Sunday in Ordinary Time, it was a great day to stop and reflect on how we had lived the past year, and to look ahead to the new liturgical year with “New Year´s resolutions” for our spiritual life.